For ultra-smooth flow control in their swimming pool ozone generators, UltraPure Water Quality, Inc. relies on a custom-made version of our JACO Smart Fittings. Over the years, ozone has become increasingly popular in the Pool & Spa Industry. 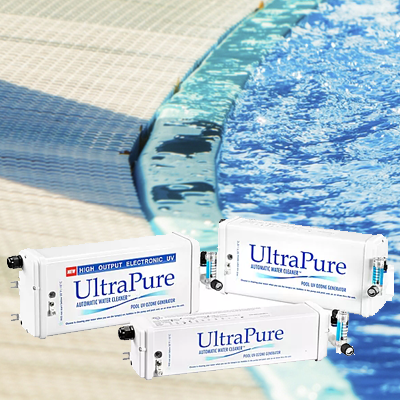 UltraPure Water Quality, Inc. has been improving the pool and spa experience since 1982. Their current ozone generators rid pool water of any non-living contaminants, such as lotions, oils, make-up, and ammonia compounds. Ozone usage allows a more harmonious balance of pH levels in swimming pools, which reduces the need for any extra chlorine (by up to 70 percent). Additionally, the need for specialty and harsh chemicals as cleaning agents is virtually eliminated. Once this application is installed, ozone is produced on-site. As the pump runs, the pool water is automatically cleaned and purified (source: waterquality.net). 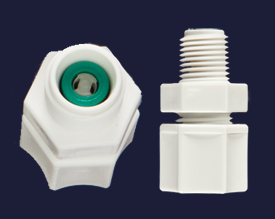 To ensure precise flow control of the ozone/air mixture for the generator’s circulation pump, a customized JACO Smart Fitting is inserted at the injection point (example: pictured right). During pump operation, the internal check valve allows ozone to be drawn into the pump. When the pump shuts off or switches to a lower RPM, the valve closes and allows the pump to maintain prime. Headquartered in Ontario, Canada, UltraPure produces high quality swimming pool and spa water applications for worldwide distribution. They focus on high standards from the initial design and testing phase all the way to training, support, and education of their installation-ready products. For more information about UltraPure’s ozone generators, click here. 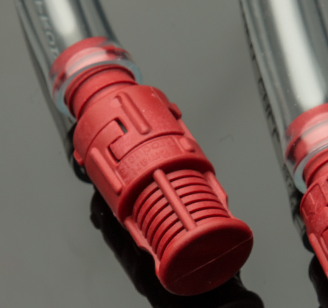 The customizable nature of our products allowed us to create an ideal low pressure, low flow control option for UltraPure’s unique design criteria based on plastic body and o-ring materials, as well as a precise opening spring pressure. For expert technical assistance or to get started on building your own custom product, call 1-800-338-0404 or email sales@smartproducts.com. The filtering or foot part of this valve can be dipped into a tank or any type of atmosphere to prevent larger particles such as leaves, rocks, sticks, etc. from interfering with a line. Any, but this valve is especially popular with the Water Treatment and Pool & Spa industries. Model #315 is typically used as an inlet with an internal Model #150 or Model #160 cartridge valve, as well as your choice of a variety of barbed or NPT outlets available in our Series 300 Modular Check Valves. Note, Model #315 can also be used as an outlet, but we most commonly see it used as an inlet. For questions or to order, contact us at (800) 338-0404 or sales@smartproducts.com. To view a PDF of our entire product catalog, click here.